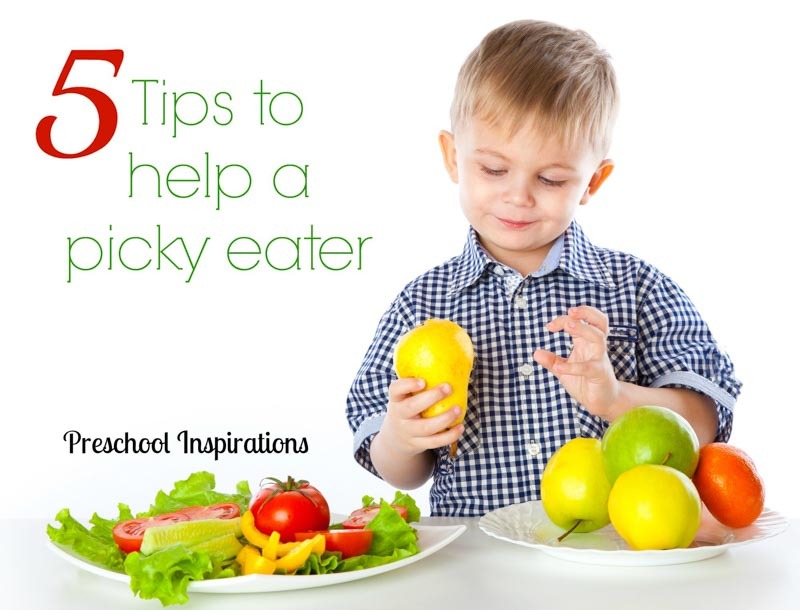 I am sharing my top tips for helping picky eaters! These are preschool teacher approved methods that can be useful for children who are picky, have texture sensitivities, or are reluctant to even try a new food. It can be quite rough to get a picky eater to eat. I’ve had children in my classes over the years who have refused foods because they “don’t look right,” because they are a fruit or vegetable, or just because the food is new. So I’m bringing out my best tips and tricks to get children interested in tasting foods they otherwise would have no interest in. In general a child may not be interested in eating a food unless it’s been introduced over 20 times. That’s a lot! With extra picky eaters, I’ve seen it happen closer to 100 encounters with the food. Overall, patience is incredibly helpful. Let me show you how I help transform picky eaters into children who are willing to expand their horizons. If you are dealing with extreme eating issues, here are two books which specifically deal with this topic from medical professionals. I’m not the food police. Don’t get me wrong though. I’m willing to be enticing to encourage children to take a bite of peas. I don’t even like peas, but you wouldn’t even know it. I’ll even eat them in front of you with a giant smile, and I’ll gush with your sibling or friends about how much we all love peas and they make us big and strong. However, there is no pressure. If you don’t like them, they will stay in the serving bowl in the middle of the table. Children are more likely to try new foods when they are not pushed into it. There are even negative side effects to forcing it. So trust me on this one, you don’t have to make it a power struggle! When I serve children, I let them choose how much they would like on their plates. This has so many advantages. It cuts down on waste, helps them visualize how much they want to eat, and even gets them to try new foods. Initially, this does involve some training, and there will be a bit of excess on their plates until they learn how to gauge how hungry they really are. While working at a child care center, I let the children put every component on their plate. Since life at home has way more responsibilities, I typically put the fruits and veggies in the serving bowls and put the rest on for them. We have tongs or spoons for the serving containers, and they love to practice putting the items on their plate and passing it around the table. I do notice that with a picky eater, the serving bowl could go around hundreds of times literally without being touched. Then comes the day. That one day they put one vegetable on their plate, and that is huge. They will probably put a carrot stick on their plate several times without touching it, but that’s OK. I don’t force it. Results do come though. Lucas does not want to eat the watermelon. He’s never tried it actually. So I say, “do you wanna lick it?” At least 50% of the time they do! Peer pressure works great too. Sometimes I hear Carol tell Allie, “I love the pears! You should try one. It tastes so yummy.” Good job, Carol :). Or I’ll describe the texture. “WOW, this celery is so crunchy! Who has the crunchiest celery?” You see where I’m going? I promise I have no formal training in theater. Anyone could do it. If you feel completely awkward and overly silly, then you’ve nailed it! In order to talk about it, it’s important to offer healthy and varied foods on a regular basis. Additionally, it requires modeling. Hence, why I eat items I wouldn’t normally choose. This might sound crazy, but I’ve known children who would only eat foods that were a specific shape. That’s pretty rare, but it gets me thinking. What if I cut the fruit with a crinkle shaped cutter? Perhaps if the carrots were long, matchstick shapes instead of circles? What if the egg was shaped like a rabbit or bear ? This is where favorites such as “ants on a log” are handy. You can fill a celery stick with cream cheese or peanut butter and add raisins on top. Even if they’re just licking the peanut butter off the celery stalk, they’re still interacting with the celery, which will make them more likely to taste it in the future. I’ll even do this with dips. We usually avoid ketchup or certain dressings just because there can be lots of added sugar and calories. However, if you don’t normally eat the spinach, but you’ll lick the dressing off, then by all means, you can have some spinach with that dressing! My son choked on everything as an infant. I was not sure how a child could forget to drink milk so quickly. When it came to solids, I thought we were doomed. He had horrible feeding issues, and those mesh bags were a lifesaver for the longest time. I say this because not everyone realizes that sometimes a picky eater has an aversion to certain textures. Perhaps the smooth texture of many vegetables and fruits sends their gag reflex into overdrive, and they are just not willing to risk it. I don’t blame them either. I’d rather not choke myself if I could avoid it. If your child is completely willing to skip meals and avoids vegetables or fruits, it is worth talking to your pediatrician about. 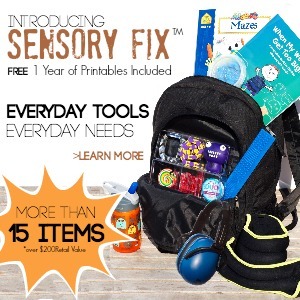 The month of October is Sensory Awareness month, and it is a huge reason why I decided to write about this topic. It is one of many posts in a series about decoding everyday kid behaviors. To read more common yet difficult child behaviors and to see the rest of the topics in this series, you can visit Lemon Lime Adventures. Please keep in mind that I am not giving medical advice or offering solutions. I am sharing my own resources and experiences as a mom who has been there and also as a veteran teacher who has seen some of the pickiest eaters on the planet. These are great ideas! I just recently started making my daughters peanut butter sandwiches using cookie cutters. Some days it’s a fish shape and others days a heart or star shape, it really does help get her to eat!! Oh I love that, Susen! It’s such a brilliant idea :).